It's fair to say that the Nokia 9 has been the longest rumoured phone of the past few years. There are references to a Nokia 9 all the way back to 2017 and when those rumours started to include a five-camera system, things started to get a little unbelievable. But here we have it: the Nokia 9 PureView is real, it does have five cameras, and lining up against 2019 flagship devices launching alongside, it's one of the most unique devices in the smartphone space. HMD Global, it seems, doesn't want to just follow the pack and add a wide-angle and zoom lens like everyone else, instead it's returning to Nokia's previous PureView aims - image quality. We're going to dive straight into the camera, because that's what you want to know about, right? It's a five-camera system developed in close collaboration with Light, who previously produced a 16-camera device, the L16. Qualcomm has also worked closely on the Nokia 9 PureView to ensure that the Snapdragon hardware can drive this camera, using the image signal processor to best effect. There are five Sony sensors, all 12-megapixels with 1.25µm pixels, sitting behind Zeiss lenses. Three of these sensors capture monochrome and two capture RGB (colour). The aim here is that the monochrome sensors capture all the light data full of detail and add that to the RGB data to create an image. Having more lenses means it can use bracketing - taking simultaneous images at different exposure settings effectively - to get data that a normal camera wouldn't. For example, you can have those monochrome sensors underexpose and overexpose respectively to capture detail from highlights or shadows that the other wouldn't see. It's a system with a huge dynamic range - 12.4 stops - with the aim of giving you lots of details whatever the scene. What's more, Nokia is working with Adobe Lightroom for processing of the DNG RAW file it produces, so you can make tweaks on the device before the final JPEG is produced. So - we hope you're still following - those cameras will capture at least 60-megapixels worth of data, but it could be up to 240-megapixels. You can then take the JPEG/photo it gives you, or edit it for different results, with the final image being a 12-megapixel photo. Of course, we've not actually seen the results - apart from a few test shots on pre-release software - so we can't judge how successful this all is when it comes to final image quality, which is the big question that hangs over this approach - is it all going to be worth it? Nokia is also giving you a "tripod mode" where you'll be able to hand-hold a night shot for up to 10 seconds, similar the Pixel 3 XL or Huawei Mate 20 Pro. Elsewhere, the Nokia 9 PureView will be able to capture a huge amount of depth data, about 120x that of a normal phone (1200 layers), meaning you can refocus an image post-shooting from 7cm to 40m distant. There's no "portrait mode" per se, but shooting in depth mode will mean you can take that shot and then decide exactly what the point of focus should be - like the eyes, for example. There's a lot to learn about this camera - something we'll do in a full review - but we're excited about this phone's potential to stand-out and be a little different. At the same time, we're concerned that people won't understand its potential. Will it be the best smartphone camera ever? Possibly yes. Will it offer all the easy features people want? Possibly not. 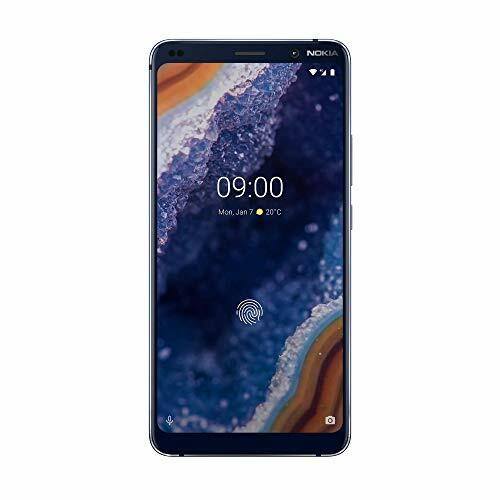 Moving on to the rest of the phone, the Nokia 9 PureView is an elegant design, but fairly typical of what we've come to expect from Nokia under HMD Global's tutelage. It starts as a block of series 6000 aluminium which makes up the core and frame of the phone, then fronted with Gorilla Glass front and back. It only comes in one colour - Midnight Blue - and it is IP67 rated, so Nokia is at least keeping up with rivals in that regard. There's no notch on the front of this phone and that results in forehead and chin on the front. While rivals are pushing back the bezels, Nokia is likely to attract some criticism for a design that's not as 2018 as some others - but to us that's a minor point really. Another area where people are going to ask questions is about an ambitious new smartphone launching in 2019 on Snapdragon 845 - the platform of 2018. Yes, the Nokia 9 PureView is a little behind the times, but there's a good reason for that. Nokia, Light and Qualcomm had to work together on this unique camera system and a huge part of it is the processing that's carried out by that Snapdragon hardware. It's a custom arrangement and Nokia has told us that launching on Snapdragon 855 would mean that they couldn't launch the Nokia 9 now - because they'd need to develop those solutions again. There's 6GB of RAM and in this case, Nokia needs it to do the heavy lifting in the camera - it's not just vanity RAM like many rivals. We've tried taking some photos on the Nokia 9 PureView and seen some processing time indicated (especially in depth mode) - but as it wasn't final software, it's hard to gauge the final performance of this device. So does the older hardware matter? No, in all likelihood it will make very little difference at all to the sort of daily things you do with phones - social media, emails, gaming. Snapdragon 845 has been a great performer on 2018 flagships, so dismissing the phone for that reason alone would be naïve. If the camera isn't what you want, then fair enough, dismiss away. The battery does give us a little cause for concern. At 3320mAh, it's not hugely capacious and while HMD Global assures us that Qualcomm's optimisation of all that camera data processing brings efficiency, this still has to function as a phone. Will it last as long as rivals? We'll have to wait and see. On the plus side you do get wireless charging as well as Quick Charging via cable. There is no 3.5mm headphone socket. Nokia offers a clean build of Android which is one of the nice things about its phones - the adherence to Android One. While rivals like Huawei or Xiaomi layer in bloat and customisation, the Nokia 9 PureView is as close to pure Android 9 Pie as you'll get - except for Google's photography master the Pixel 3 XL, a natural rival. Nokia's addition is the Pro Camera - with new shooting options to support that camera system - and a My Nokia app that lets you get support and engage with the Nokia community. Nokia's promise to be pure, secure and up to date has proven to be true: it's months ahead of many rivals when it comes to pushing software updates. That was evident with 2018 phones moving to Android Pie, where Nokia very much leads the pack. Using Google Photos, you get some photo editing - you'll be able to edit the depth effect for example - as well as all the auto-functions that Google offers in Photos. With full RAW editing not just offered, but suggested, Adobe Lightroom will offer full support to let you tweak a lot more. It's a software solution we like a lot. The Nokia 9 PureView is going to be sitting in the flagship space, not too expensive and with bloat-free software. The question is whether people will want this. Will they forego the slick design and super-consumer skills of something like the Huawei Mate 20 Pro or Samsung Galaxy S10 and choose Nokia? Because while Nokia has created something remarkable in this camera system, the other side of the device bears the brunt of that development.